Smart Colors Playing Cards - Avonmore, Inc.
Also known as No-Revoke cards, the diamonds are blue, not red, and the clubs are green, not black. We have added Smart Colors playing cards to our product line and they have been well received by poker players as well as bridge players. We arrived at these particular shades of blue and green after a study of colors that would be especially beneficial for most players who have vision difficulty with color. 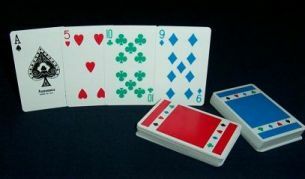 Bridge players have said enthusiastically that the Smart Colors playing cards are a great idea. Since card players often confuse the red suits (and sometimes the black ones). How many times have you known a bridge player to bid a contract of hearts and then find a diamond among the hearts or a club among the spades? It even happens at tournaments. Skill level is not the issue. Four suits are different colors to avoid playing the wrong suit by mistake. Children love the four-color design, and they play other card games that use a standard deck. The cards are packaged in sets of 2 decks in a custom designed tuck box. The cards are high quality, made in the U.S.A. by the leading manufacturer of card games. Copyright 2003 Avonmore. All rights reserved. The playing cards may not be reproduced in any form or colors without permission.